Recently I was checking out classic car books at the local library when I came across one that I’ve never seen before but is now a new favorite. Cars of the Fabulous ’50s: A Decade of High Style and Good Times, by James M. Flammang and the auto editors of Consumer Guide, is full of so many photos, illustrations and information that you can read it over and over again, picking up a new tidbit each time. Each year in the decade gets an introductory two page spread that talks about auto production and current events in the USA for that year. So for 1951 you’ll learn not only that Chrysler issued a 150-horsepower Hemi V-8, but that Korean War industrial production requirements were causing chrome trim on cars to be thinner. Above you can see a close-up of one the pages related to 1955 Fords. Below see the double-page spread of this same topic. What really blew me away about the book are the excellent graphics and information, which I’ve tied to capture in these photos but you really need to see the book in person. Vintage ads are shown side-by-side with the actual car it marketed, along with detailed breakouts of each model. 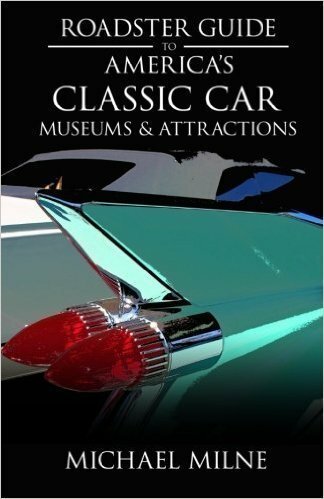 Cars of the Fabulous 50s was published in 2001 and new and used copies are plentiful on Amazon. And if one decade isn’t enough, other books in this wonderful series include Cars of the Fascinating ’40s, Cars of the Sizzling ’60s, and yes, Cars of the Sensational ’70s. The latter one has the dream cars from my teen years that focused on disco, bell bottoms and long sideburns. I’d like to get all of these books for a complete reference library of American cars of those eras. Note: Don’t be turned off by the high prices listed below. These books are available on Amazon for much cheaper pries than they list here.